Thoroughbred are used world wide for the purpose of the multi million dollar business called racing! All thoroughbreds are descendent from three stallions: Darley, Godolphin and Byerly Turk all of these are from the arabian breed. The arabian breed is from Eygpt, they are known for the stamina and there strength as they were used to carry people and carts in the desert. 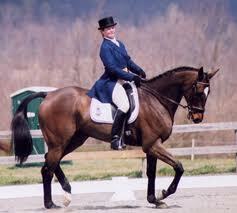 This is why the thoroughbred is bred from the breed of the arabian. Aso, Thoroughbreds who are racing must be tattooed before they can leave the start gate. The tattoo represents their full breeding of thoroughbred. The breed must be full and proven with papers before the horse recieves a tattoo. This tattoo is located under the upper lip of the horses mouth. This tattoo is done with a tattoo gun. It consists of numbers and letters. These numbers and letters is a tracting device for the Ontario Thouroughbred Association.